"Just two books into his publishing career, Geoffrey McGeachin has established himself as one of Australia's most readable -- and enjoyable -- authors. FAT, FIFTY & F***ED! was one of the most exhilarating debut novels in many moons and marked McGeachin as a writer well worth following. It was wildly imaginative, irreverent, bitingly funny, beautifully paced and populated by the sort of characters we'd all love to know -- or even be. His follow-up, D-E-D DEAD! maintains the excellence McGeachin displayed in FFF ... McGeachin dishes up a wonderfully entertaining tale, rich with humour, an abundance of thrills and a pace that never flags. The story has it all -- intrigue, action, double-crossing agents, exotic locations, romance, murderous pirates, hardened hoons and cross-country chases, not to mention culinary delights that set the tastebuds tingling. McGeachin's dexterity with language, in both the first-person narrative and in dialogue, is a joy." "Fast pace and terrific settings ... this is a completely enthralling spy thriller. Setting off at a frantic pace and crammed with the biting commentary of special agent Alby Murdoch, D-E-D DEAD! is a completely absorbing spy thriller that takes us from Melbourne to Bali before delivering an unforgettable ending in Australia's outback ... The main characters are well-drawn and complement each other nicely and the premise that holds the story together is wild, yet entirely believable. D-E-D DEAD! is one of those books that grab you from page one and doesn't let go until you've reached the shockingly satisfying end." "Meet Alby Murdoch: photographer and Australian secret agent. McGeachin, who enjoyed popular success with his debut novel FAT, FIFTY & F***ED!, is back with a new hero; one who is likely to be around for some time. Alby's partner is gunned down in a Double Bay coffee shop and the body count rises quicker than Celine Dion's voice. McGeachin has the Australian idiom just right and the bad guys are believably bad in comic-book style. A rollicking yarn with some sly humour ideal for enjoying with a six-pack of Cascade, some chili peanuts and an Aimee Mann CD on the stereo." "enormous, great, rip-roaring, laugh out loud fun!" "I love books that make me laugh. That include pointed digs at the stupidity that we all deal with on a daily basis. So I loved D-E-D DEAD! It's pointed, it's funny, it's borderline silly in some places and it made me happy! Okay, there's not a lot that's particularly serious in D-E-D DEAD! as you can probably tell from the book synopsis, but there are moments of inspired hilarity. Tongue-in-cheek, quintessentially Australian, Alby Murdoch's a spy who's dangerous to know ... politically incorrect and fun -- enormous, great, rip-roaring, laugh out loud fun!" "Homespun intelligence with a humorous touch"
“D.E.D is the Directorate for Extra-territorial Defence, an ultra-secret government department tasked with providing intelligence gathering services for the Australian Government. Disguised as Worldpix, an International Photo Agency, D.E.D sends out its agents (or dedheads as they affectionately call themselves) posing as photographers. Thus they have free access to the world stage where they mingle photo shoots with heavy duty espionage. Think Man from U.N.C.L.E or I Spy and you get a sense of the scenario, though D.E.D has a typical Aussie feel about it, even down to the ubiquitous public service orange slice biscuits. Alby Murdoch is a wisecracking, senior agent enjoying his life as a world famous globetrotter. He's pissed off when he and his partner Harry are given a seemingly pointless and boring administrative job; issuing security clearances for the US personnel of Bitter Springs, a secret US base in central Australia. When things go pear-shaped and Harry is shot to death in a Double Bay coffee shop, Alby knows he has is stepped into something nasty. He's glad of the assistance of the stunningly beautiful and equally dangerous Grace Goodluck, but who is she exactly? From the opening page's incident with the gun on the No.16 W Class tram traveling down St. Kilda Road you'll find yourself chuckling out loud at this guy's hilarious exploits. "Now that Don Adams has passed on to the great security operation in the sky, there is a vacancy for people who can see the funny side of the unresolved crisis between Kaos and Control. Geoffrey McGeachin does a good job of letting the air out of a few puffed-up spies and their masters. (He) has a nice sense of the overlap between reality and the absurd. Those who enjoyed FAT, FIFTY & F***ED! will be glad to see the same knockabout humour in a broader satire of security neuroses." "... excellent laconic humour ..."
"Spy fiction has a long and venerable tradition, mostly from the superpowers. Geoffrey McGeachin provides an Australian entry. As might be expected, his spook Alby Murdoch is no Andrew Wilkie. But he is a genuine action hero, with a truly Australian irreverence." "... Guns, girls and the Australian landscape -- it's a simple but effective formula. 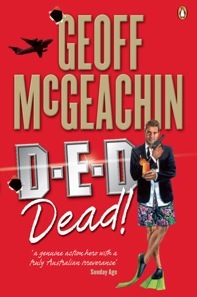 A fast-paced, easy-reading novel, D-E-D DEAD! is enjoyable and packed with dry Aussie humour -- for those who want to be entertained ..."
"Alby Murdoch is an international photographer and Australian special agent and he's in for one hell of a day ... D-E-D DEAD! is billed as an adventure thriller but, more aptly, is a romping, rolling, rollicking adventure ... full of conspiracy, action ... an easy read which fans of the genre will appreciate."